Whether you’re thinking of building a log cabin or full-time home, Amish Made Cabins features several different styles of small log cabins. Their kits make building a log cabin easy, and you’ll have the great experience of building your own cabin. 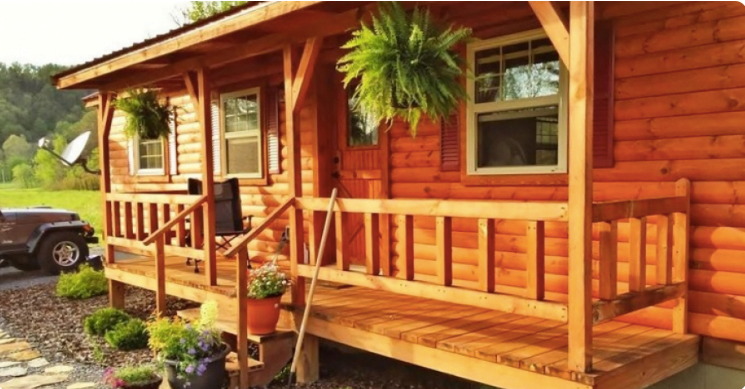 Each of the log cabins comes with its own unique style, and floor plan and customers can also alter the plans as they see fit to make their cabin suit their lifestyle. All of the small log cabins start at 14 feet by 28 feet and go up to 14 feet by 48 feet. Customers can also attach two cabins together to create a space that’s around 1,300 square feet. If you’re looking for a cabin that’s smaller or larger, they will also create a custom cabin for you. The nice thing about their cabins is that they either come with an inset porch or the customer can add on an extended porch for extra. The Appalachian log cabin design is one of their most popular designs because of the spacious and open floor plan in the living area. Then you have the Kentuckian Cabin’s more modern look with gables on either end. The Boone design is one of the smaller designs, but it still has enough space for a small kitchen area so even if you’re camping out, you don’t have to sacrifice the comforts of home. They also have the Cumberland which is much like the Kentuckian as well as the Weekend Retreat and their newest log cabin design called the Bluegrass. The Lincoln log cabin would be great for those smaller or narrow lots, and the Olympic T option is the one where you can combine two cabins together for the largest option. The cabins come with everything needed to build them, and the floor plans include at least one bedroom, one bathroom, and a kitchen. The company creates all of their cabins out of Eastern White Pine that’s milled right in their shop by Amish craftsmen. Eastern White Pine is very easy to work with, plus, it’s light yet very durable, and it won’t shrink up as much as other types of wood either. Using natural materials like wood and timber in home building is always going to be more environmentally friendly than using other building materials. So long as the wood comes from sustainable tree plantations, it’s considered a very sustainable choice for construction. If you have a piece of land that has a lot of trees on it, you could even use the trees in building a log cabin, which would be the most sustainable option. The next most sustainable option is to find materials locally from local tree plantations and mills. Also, using recycled materials is a very eco-friendly option, plus, you’ll save money as well. The log cabins are constructed out of white pine 4×4 post and beam 4 feet on centre. Then, the siding is made from white pine tongue and groove half logs to give the appearance and insulation of a full round log without the high cost. Each of the log cabins is insulated with polystyrene insulation, and then the interior walls are also created out of white pine tongue and groove panelling as well as the ceiling boards and the floors. An insulated fibreglass door is included with the kit as well as the insulated windows too. For the kitchen are the upper and lower cabinets, and a laminate countertop with a sink is included as well. Also, all bathroom fixtures are included as well as an exhaust fan, but all of the plumbing must be done. Does this beautiful log cabin catch your eye?